The third ChemOrbis Turkey Annual Event took place at the Four Seasons Hotel Istanbul at the Bosphorus on September 9, 2014, bringing together more than 350 attendees, 20% of which came from 25 different countries outside Turkey. 40% of the overall attendees were converters in the plastics sector. During the day, key executives from leading companies of Europe, Asia and the Middle East made presentations on global petrochemical and polymer markets while the event also provided networking opportunities to the attendees during several coffee breaks, an open buffet lunch and a gala dinner. Mr. Alex Lidback from Wood Mackenzie opened the conference with a presentation about global feedstock markets. 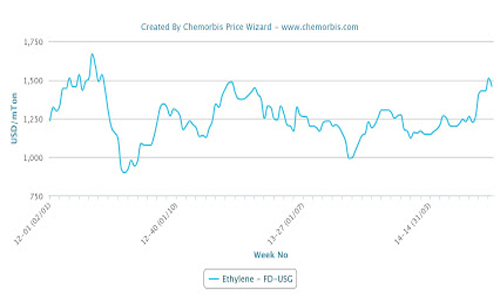 Mr. Lidback predicted that ethylene prices would remain relatively cheaper than propylene over the next few years due to reduced propylene output from lighter feedstock cracking, adding that this would continue to drive investments in on-purpose propylene. Next, Mr. David M. Lines from Nexant Inc. UK gave a presentation on the current situation of global polyolefins markets. His presentation included forecasts regarding the growth of ethylene and propylene consumption up to 2020 as well as an overview of global polyolefins net trade figures by regions in 2013 and estimates for 2018. Following the first networking coffee break, Mr. Remko Koster from IHS gave a talk about the state and prospects for the Middle Eastern chemical industry. Mr. Koster commented that the Middle East would remain highly cost competitive, although new shale-based projects in the US would come in a close second. Mr. Koster also predicted that the region’s chemical would gradually attempt to move downstream as governments will try to stimulate faster job creation by processing polyolefins rather than export the raw material. Mr. Koster was followed by a presentation from Dr. Seyed Hosseini dealing with new growth of the Iranian petrochemical sector. Dr. Hosseini highlighted that Iran to the further development of its petrochemical sector and that the country plans to achieve a greater share of petrochemical production both in its own region and in the wider world by 2020. Dr. Hosseini also predicted that legal disadvantages against the Iranian industry would gradually lessen as sanctions from the US and the EU were likely to see further easing in the coming years. The afternoon session started with a panel discussion named ‘Which factors will determine polyolefin prices?’, where the senior analysts of ChemOrbis Market Intelligence team examined the past trends of the past two years and drew crucial lessons before putting forward their expectations about the last quarter of this year. This was followed by the presentation of Michel Cassart from Total Petrochemicals. Cassart noted that although PS has the largest market share among styrene derivates, EPS and ABS have a stronger expected demand growth than PS. He also shared information about the growing importance of insulation in the EU in order to increase energy efficiency and the role of styrenics derivates in the insulation sector. The final session began with a presentation from Mr. Hosu Batra from Dhunseri Petrochemical/EIPET discussing the global PET market. Mr. Batra commented that PET and several of its feedstocks are facing global oversupply and that is likely to keep average operating low over the next few years. Regarding trade patterns, Mr. Batra said that PET was likely to become increasingly regionalized and it would be important for PET producers to have either a domestic market or a nearby market in which they could easily sell to if they hope to prosper in the coming years. To wrap up the day’s proceedings, Mr. Henry Warren from IHS Chemical discussed the changing dynamics in global PVC markets during his presentation. He emphasized that changes in regulations are leading the European PVC markets to a major transformation while Asia is struggling with overcapacity and overall PVC demand in both Europe and the US is slowing.